Mentation. Cerebration. Thinking. Critical thinking. The ability to discuss and analyze issues is something we as a people are without the rudimentary ability to enjoy. 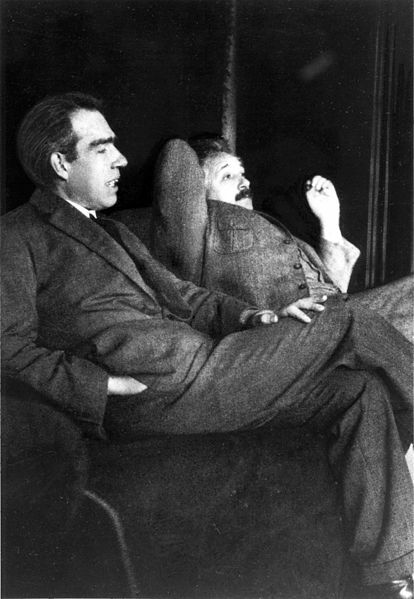 Imagine what Bohr and Al supra were discussing. I can only imagine. Neils would be yakking about quantum mechanics and the fascinatingly crazy and hardly predictable world of the subatomic while Al shook his head wondering what the hell this kid was smoking. And if he had an more. This afternoon I taped a piece with Alex Jones that was/is scheduled to appear at 8 PM EST today on his network. Alex is simply without peer when it comes to his platform and delivery system. He’s mastered ever medium of data and information delivery imaginable, viz. radio, audio podcasts, TV, documentary, print, carrier pigeon, cuneiform, smoke signals . . . but I digress. The man’s a citation machine. And as I’ve often admonished citizen historians and observers, demand citation, reference and authority. Insist upon the source of a claim being made. Jones spews citations relentlessly, without surcease. And his powers of steel trap recall are frightening. And I don’t mean vague recollections; I’m talking statutory particularities and arcana that would impress the most encyclopedic of eidetic memory mavens. He’s a whirlwind. A dynamo. A machine. The passion he possesses is unheard of in conventional broadcast spheres. His teeth-gnashing grit and excitement, his perfervid adherence to his mother Constitution inspire me. He’s a whirlwind, a machine and a cosmic force not to be trifled with. Dismiss him at your own peril. In this podcast I examine the glory of gymnastic thought, the sheer fun and excitement of imagination and daydreaming. Revolutionary reverie. Remember when you were a kid and you’d play with toys or maybe dolls and imagine . . . when did you stop? Why did you stop? And below, a video tidbit for your perusal and review. ← LIONEL PODCAST: It’s Rigged! Wake Up, Sheeple. It’s A Work. The Fix Is In. Stop Analyzing. Start Realizing.